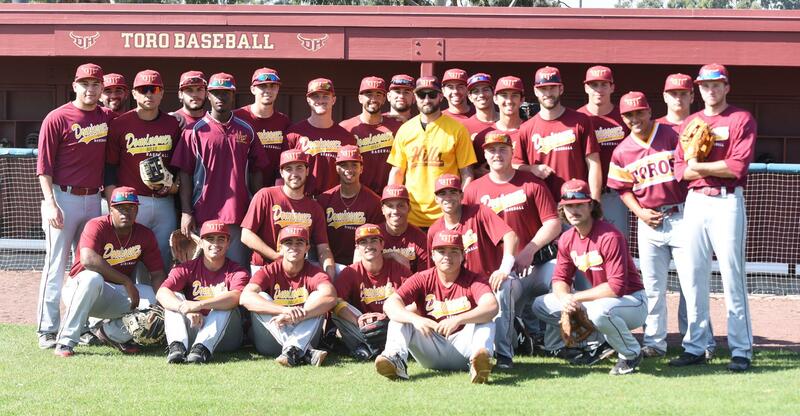 Current MLB player, Kevin Pilar (center, in yellow) was one the CSUDH alumni who appeared at the alumni game Feb. 3 at Toro Field. The 2018 Toro baseball season is upon us, with the first regular season game at home Thursday, Feb. 8, a fitting place to start a campaign in which the team hopes to improve on its fifth-place finish in the southern division of the California Collegiate Athletic Association in 2017. There is plenty of optimism surrounding this year’s team, as 13 letter-winners return from last season. Some key returning players include three seniors: fourth-year outfielder Daryl Donerson, who batted .292 with 22 RBIs last season; second-year third baseman Esteban Ortega, who swatted 19 doubles and 31 RBIs; and pitcher Nick Suniga, who led all pitchers with 49 strikeouts. These seniors look to provide leadership for a team that added 18 new players to its roster. In charge of the new and returning talent is third-year head coach Tyler Wright. Before coming to CSUDH, Wright spent the prior six seasons as the associate head coach at Biola University from 2007-13. He led Biola to the postseason five times, made five regional appearances, and reached two NAIA World Series opening rounds. After serving as an assistant coach in 2015, Wright was named interim head coach at CSUDH for the 2016 season and by the end of that year, was appointed permanent head coach. At CSUDH, Wright has coached seven All-CCAA selections and has coached two players who were drafted by Major League Baseball teams. Wright said that the team is much deeper than it has ever been in his time at CSUDH, especially the pitching staff. As a part of that depth, the Toros expect big things from players such as Willie Traynor, a transfer sophomore from UC Santa Barbara. “We are always preparing with the mentality to compete to win a conference championship,” Wright said. With so many new players, team chemistry will be a key part of the success for this year’s team, Wright said. For leadership, the Toros look to players like senior Ortega, who started every game last season. “The team is a family, we all see each other putting in the extra work and that brings us together as one,” Ortega said. The hard work from the offseason will be put to the test this weekend, as it hosts California Baptist University for three games, Feb. 8, 9 & 10, Thursday and Saturday’s games starting at 2 p.m., and Friday’s starting at 6 p.m. A longtime NCAA Division II powerhouse, the Lancers are moving to Division I in July, 2018, joining the Western Athletic Conference. The Toro’s begin conference play Feb. 22. Marry for Love? Or for Legal Status?